Railing Dynamics, Inc. announces the release of its new product line, Metal Works, the company’s third major railing line. Metal Works railing, a pre-assembled steel component system, features superior strength and security, fast and easy installation, and a durable, triple-coated finish unlike anything on the market. The Metal Works brand currently consists of the Excalibur™ line, although the company comments that future lines within Metal Works are planned. Currently, development is focusing on expanding Excalibur, with other colors and baluster styles, and several unique accessory options. 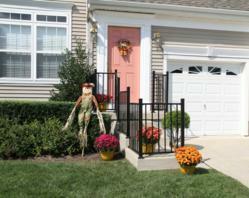 The Metal Works Excalibur railing is offered as pre-assembled, factory-welded rail panels. Posts are supplied with pre-assembled, factory-welded, brackets. The panels are available in 6’, 8’, and 10’ level and 6’ and 8’ stair sections, in heights to make 36” and 42” high railing. Since 1989, Railing Dynamics, Inc. has been a leading manufacturer of low-maintenance building solutions. RDI’s products include the Endurance® Original, Deck, Porch and ADA continuous handrail lines, Titan® vinyl-clad metal railing systems, and Metal Works™ pre-assembled, metal railing. The company’s products are marketed through a nationwide network of preferred distributors, with support from RDI’s national sales force and hands-on factory training. For more information on RDI, or to find your nearest distributor, call (877) 420-7245 or visit http://www.rdirail.com.